The dictionary says that ‘competent’ means having sufficient skill or training (to do something). So can gaining health and safety skills by means other than training deem you as competent? Conversely, does a degree in health and safety necessarily make someone competent? And what really does accreditation mean for health and safety training? This article will attempt to unravel some of the confusion and help you get the most out of your learning experiences. To view more about specific courses, visit: www.castletrainingacademy.com. It is well understood that Institutions such as NEBOSH (The National Examination Board in Occupational Safety and Health) and CIEH (the Chartered Institute for Environmental Health) and IOSH (Institute of Occupational Safety and Health) among others, offer various Health and Safety qualification schemes leading to membership and, perhaps even recognised letters after your name. It is, after all, now possible to become a Chartered Health and Safety Practitioner! All of this is fantastic news for the industry, creating a real profession with high levels of attainment available. But where does this leave specialist and technical competence training such as that required when tackling the more technical subjects like COSHH, Vibration or Noise? Not to mention new ones like Electromagnetic Fields (EMF’s). If you were to talk to a handful of delegates on Castle Training Academy’s Human vibration or Noise at Work Competence course, you would soon learn that many of them have already taken a NEBOSH certificate or diploma. Their reason for attending will be to gain particular skills in very specific and often technical subjects like Noise, Vibration or COSHH (Control of Substances Hazardous to Health). It soon becomes clear that generalised qualifications in safety spend very little time on any one subject, relying on practical experience and the discretion of the practitioner to go forth and acquire the knowledge independently. Without doubt, good competence based training courses have an important role to play. They can provide in-depth, application based skills and knowledge to either supplement a more formal qualification or just to build up enough areas of expertise to get the job done! There are also not-so-good courses around, so care is required! Choosing the right course comes down to the skills portfolio you wish to build, what specialisms you need for your work and which ones complement your existing qualifications and each other. It is important with specialist training like this, to research carefully what is available and make sure it suits your needs. Firstly ask plenty of questions of the provider: What is the pass rate? How is the delegate assessed? What technical equipment is available? Who is the lead trainer? It is also a good idea to check out other people’s views and there are many places on the internet such as the IOSH members’ forum where you can ask people what they thought – your local inspector might even have some words to say! The whole point of a competence course is to assess the delegate’s ability to do the job, and in this way, exams are not usually the best approach. This leaves course based assessment or work-based assessment or, perhaps a mixture of both. Work-based assessment would ideally involve a tutor overseeing the delegate in the workplace and assessing the processes used. As this is not very practical, it is usually in the form of a project carried out after a course using real-life data and situations. This would normally lead to a report, which is marked as if it were being viewed by an inspector. A question is often asked of training providers as to what accreditation a course has. In the case of competence courses, there is really no such thing. Just because one course is run by an institute and another run by a private, commercial organisation, this does not mean either has accreditation in itself! In fact, most accredited competence courses are only accredited by the people who own the course! Accreditation for an organisation is available from Qualifications and Curriculum Authority (QCA) or from City and Guilds, but this is not industry, or subject specific and simply accredits the way the organisation runs it’s training (a similar scheme to ISO9001 for quality management). The current state of play in the UK is that only a couple of organisations (of those contacted) are able to offer accreditation for external competence based courses. They are the Institution of Diagnostic Engineers (IDiagE) and the British Society of Audiology (BSA). The IDiagE have now accredited the Castle Human Vibration Competence course and are assessing further courses. The BSA will accredit a course run to their syllabus and this is a competence course for audiometric testing (hearing tests). Without some form of accreditation, the field is open to less-than-scrupulous training providers and could be leaving many delegates with a false air of confidence in their level of competence! In conclusion, competence courses can be vital in filling in the knowledge gaps, but they are not regulated and can, therefore vary enormously. 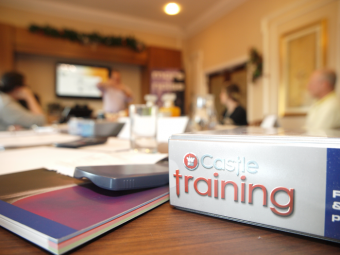 Have a look at www.castletrainingacademy.com to view specific courses that can add to your portfolio of skills.